Storm Imogen has brought winds of up to 96mph to parts of the UK, leaving thousands of homes without power and causing travel disruption. A RSPCA inspector has also gone missing following a call-out near Penzance to rescue a flock of gannets stranded by the storm and two young children were seriously injured when a stone wall collapsed on them. The ninth named storm of the winter has battered the UK leaving devastation in its wake. 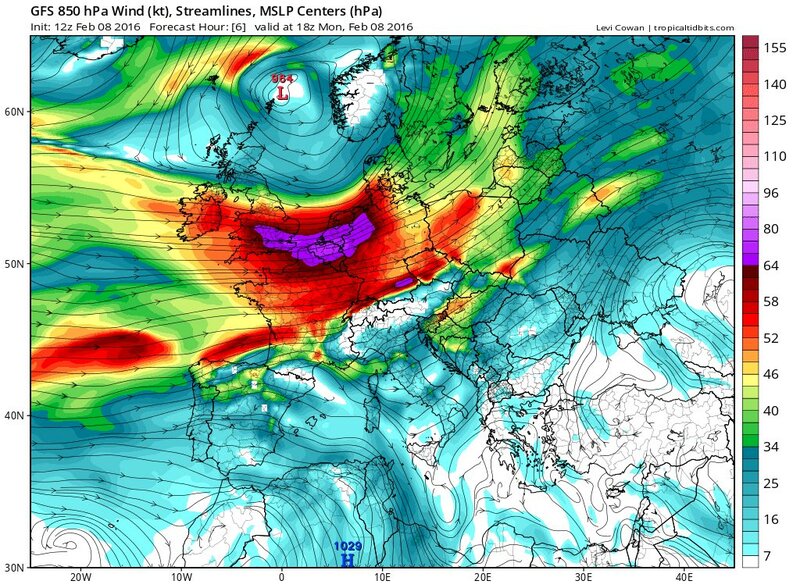 Storm Imogen brought winds of more than 90mph to British shores, leaving homes without power and causing serious injuries to people hit by flying debris. The number of homes across Devon and Cornwall without power has been increasing for most of the day. More information on cuts in your area. Coastguards have hit out after schoolchildren were pictured standing on the beach as Storm Imogen hit the South coast. The children were photographed near to the water at Hill Head in Hampshire as wind speeds up to 60mph hit the coast. It's believed that the children were on a trip - but there concerns that their safety was put at risk as the weather conditions were so unpredictable. Coastguard Rescue Officer Brian Graham said: "We do not recommend children of that age being that close to the waves. "The waves are very unpredictable and no two waves break the same." 2/2 primary school children were on an organised trip-the waves are unpredictable & contain debris #StormImogen where was your child today? Storm Imogen looks set to continue to bring squall showers and strong wind gusts as it sweeps across the south east of the country. The Met Office has released a list of some of the strongest wind speeds recorded since Storm Imogen began - with Needles Old Battery on the west coast of the Isle of Wight topping the list with 96mph gusts reported. An elderly man has been seriously injured and his dog killed when a flint garden wall crashed down on them during winds from Storm Imogen. The man in his 70s suffered a suspected double leg break after the five foot high wall blew over as gale-force winds hit the West Sussex region. A spokesman for South East Coast Ambulance Service said the man was "fully conscious" while being treated and was taken to St Richard's Hospital in Chichester. Storm Imogen has brought a swathe of damage as 80mph winds swept across the UK, leaving more then 13,500 homes without power. Police have closed Bridgend town centre in South Wales over safety concerns as huge sea swells caused by Storm Imogen continued to lash seaside communities across southern Britain. A wave of 63ft (19.1m) was recorded by the Met Office off the coast of St Ives amid the hurricane-force winds, while waves of at least 46ft (14m) were expected off Devon and Cornwall. Bridgend town centre was shut amid fears people could be hurt by flying tiles blown from roofs as reports of storm injuries emerged. A five-year-old boy and seven-year-old girl were airlifted to hospital after suffering serious leg injuries when a stone wall collapsed on them in the Worcestershire village of Bretforton. A father and daughter near Exeter in Devon also reportedly had a lucky escape when a 100ft (30.5m) tree was blown onto their car parked outside their house, minutes before they were about to leave to travel to school. More than 13,500 properties have been stripped of power as Storm Imogen continued to cause havoc across Britain. Homes across the South West and Wales were worst affected, the latest figures from Western Power Distribution's regional breakdown have shown. Properties across the South West without power. Properties across Wales without power. Properties across the West Midlands without power. Properties across the East Midlands without power. 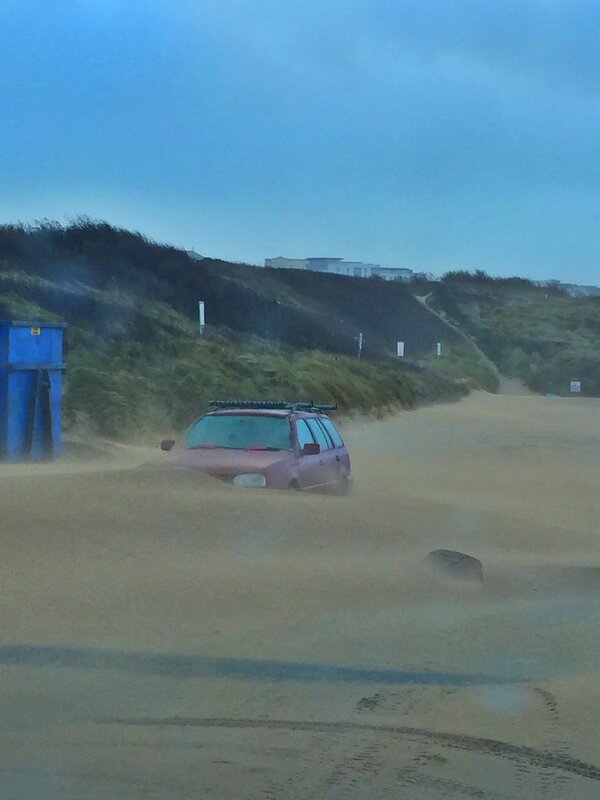 Gale-force winds from Storm Imogen that have been battering Britain's southern coastline have also whipped up a sandstorm that left a car partly submerged on a Cornish beach. Outbreaks of rain will continue to move eastwards across the UK this evening.